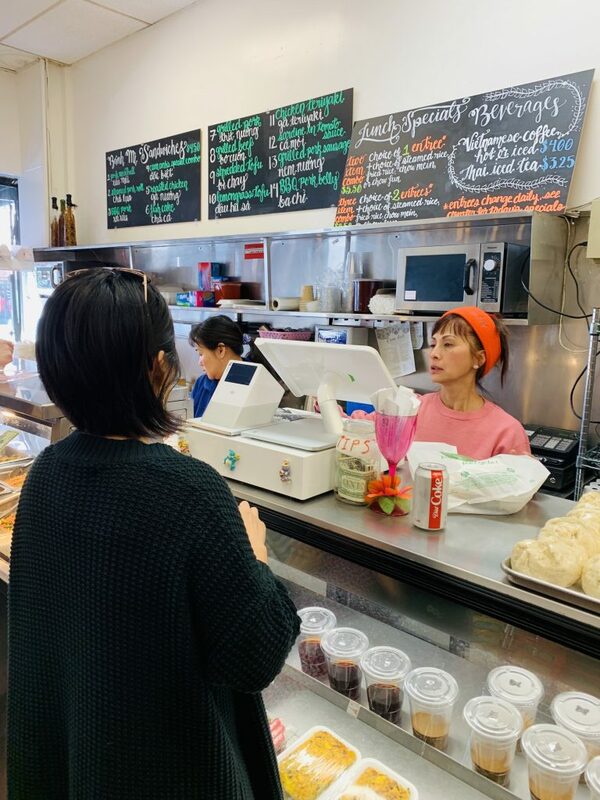 Cam Huong, the popular Vietnamese deli in Oakland Chinatown closed last Fall. I counted on this place for quick, inexpensive, and satisfying take out food. I know a lot of my friends were pretty sad when it closed its Chinatown deli, even though the larger Cam Huong, located about a mile away remained. 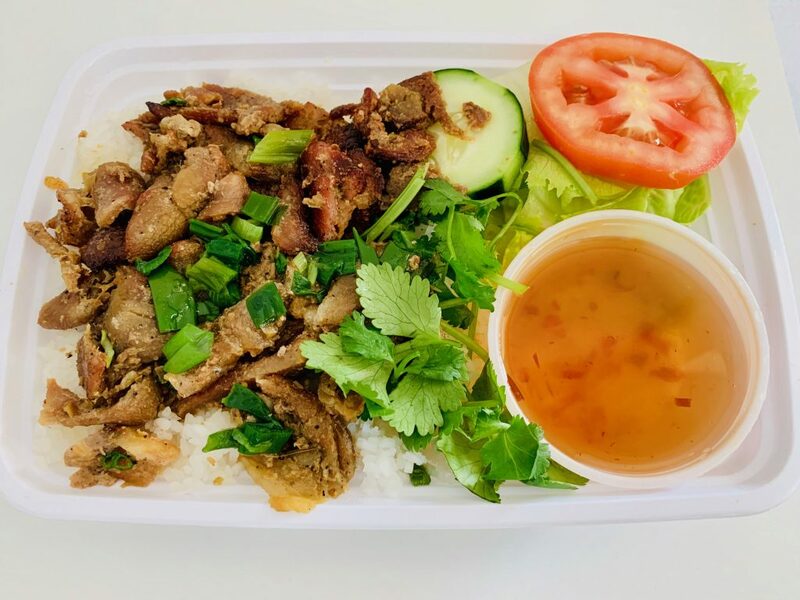 The Vietnamese deli reopened a few weeks ago as Cam Anh, named after the new owner Anh Nguyen. I took a short walk to Chinatown with my colleagues with the intention to pick up some Bánh mì sandwiches. We arrived before noon in hopes to beat any type of lunch rush. I had heard that the menu would stay true to Cam Huong, but would have some additional vegetarian options. Walking in, the deli seemed cleaner and had a more friendly feel. My friends and I ended up ordering a few different items and having an indoor picnic in the back. 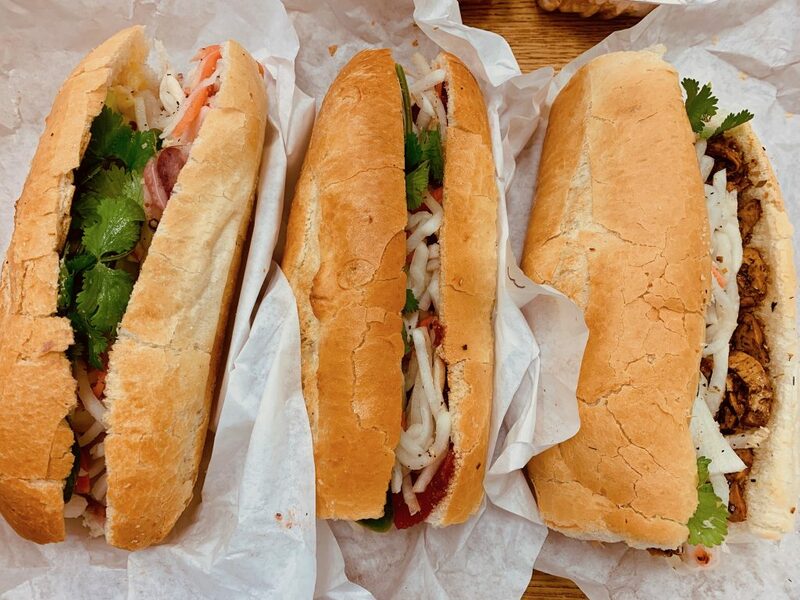 The Bánh mì sandwiches are $4.50 each and there are fourteen different selections to choose from. We tried #3 – BBQ pork, #4 – the Cam Anh’s Special combo, and #10 – Lemongrass tofu. The French bread that was used tasted very fresh and was soft on the inside, yet crusty on the outside. They were filled with the right balance of protein and fresh pickled vegetables of daikon and carrots and topped with crisp jalapeño, cucumber, and cilantro. 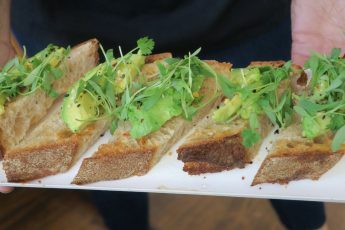 I enjoyed all three sandwiches very much, but they each had their own unique attributes so I don’t want to say one was better than the other. However, I enjoyed the creaminess of the liver pate that went along with the pork cold cuts in the combination sandwich. I was also pleasantly surprised at how much I enjoyed the lemongrass tofu, as the flavors rose to the occasion and didn’t make me miss meat. Their steam table serves a variety of entrees which you can order a la carte or as a lunch special. Lunch specials are $5.25 for one starch and one entree. 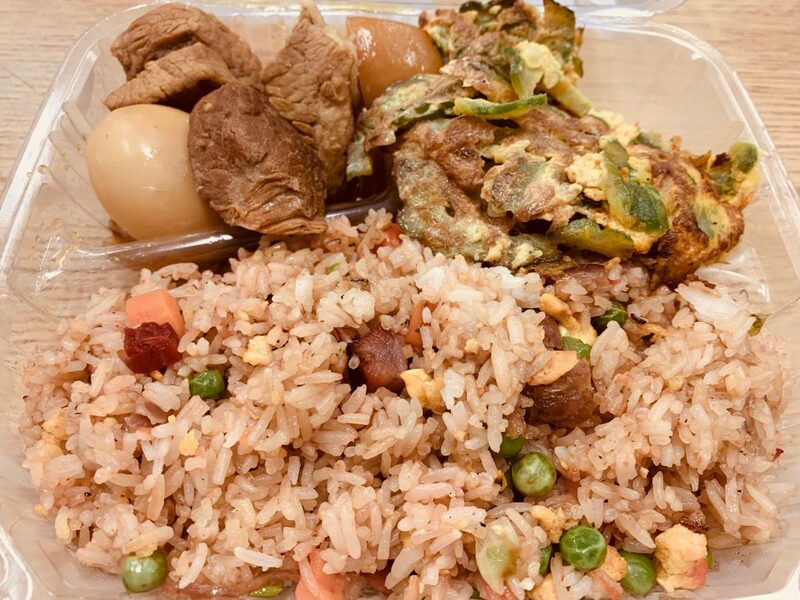 We tried a two item combination ($8.50) where we got a plate of fried rice and pork stew with egg and tofu and scrambled egg and bitter melon. The fried rice came with Chinese sausage and was pretty tasty. I thought the pork stew was extremely dry. I have never liked bitter melon because of the bitterness, but thought this version was excellent. The scrambled egg and bitter melon makes for a great vegetarian option. Cam Anh also serves a variety of pre-packaged rice and noodle dishes and a regular sized container costs $5.25. 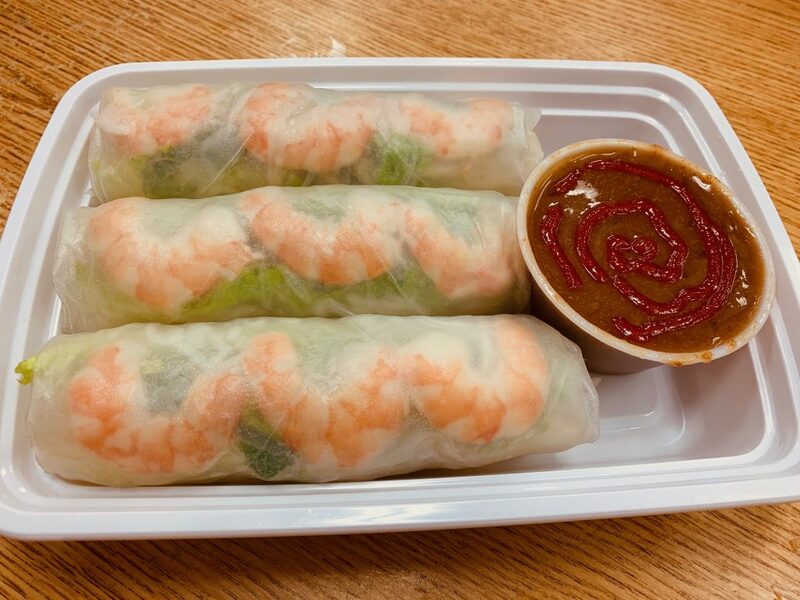 The spring rolls with shrimp were expertly wrapped and tasted very fresh which is what I look for in a spring roll as there is not much flavor to these anyways. I went back this weekend to pick up a couple of other pre-packaged items. One item I picked up was the grilled lemongrass chicken with rice noodles. 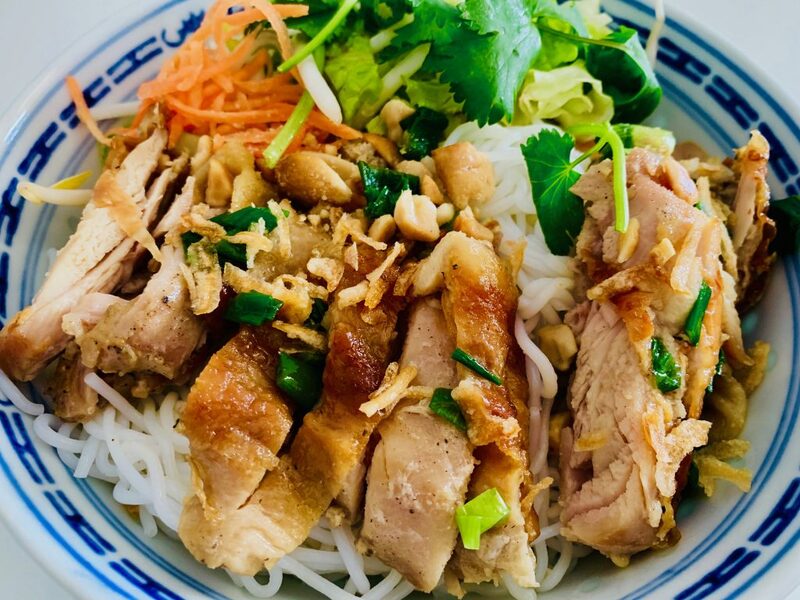 Essentially its a cold Vietnamese Bún with toppings of bean sprouts, lettuce, carrots, cilantro, cucumber, green onion, toasted peanuts, and fried onions. This was my most common item that I would order from Cam Houng and bring back to work and mix in a large ceramic bowl and pour the fish sauce over. I still feel very satisfied and healthy after eating this dish. I also picked up a container of grilled pork over broken rice. It comes with a small simple salad and fish sauce. For me, I can pick this up as a secondary item to save and eat later fulfilling a perfectly balanced and inexpensive dinner. Prices are slightly higher than the old deli, but worth the value. It’s also still less expensive than a lot of other foods. 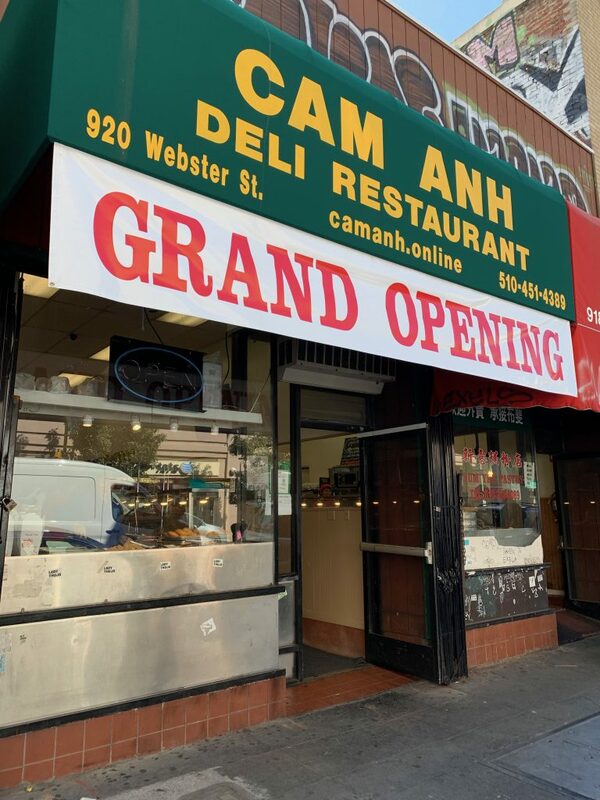 I’m truly excited that the Vietnamese Deli located at 920 Webster is back in business as Cam Anh and improved in many ways. Thanks for putting in prices for each item. It is a good reference point and nice to know in advance. Let me know when you try the grilled chicken sandwich. Do they still offer that on a croissant?